Last year, I was asked a question by another aerial coach, which was both intriguing, and at first a bit of a puzzler. She was wondering, “How do you prevent knee injuries on tissu when dropping to one knee?” This was a great question as I had not witnessed this before and was curious to know what kind of injuries had occurred. When we got into more detail, it turned out that the coach had a couple of students injure themselves performing different types of knee drops. 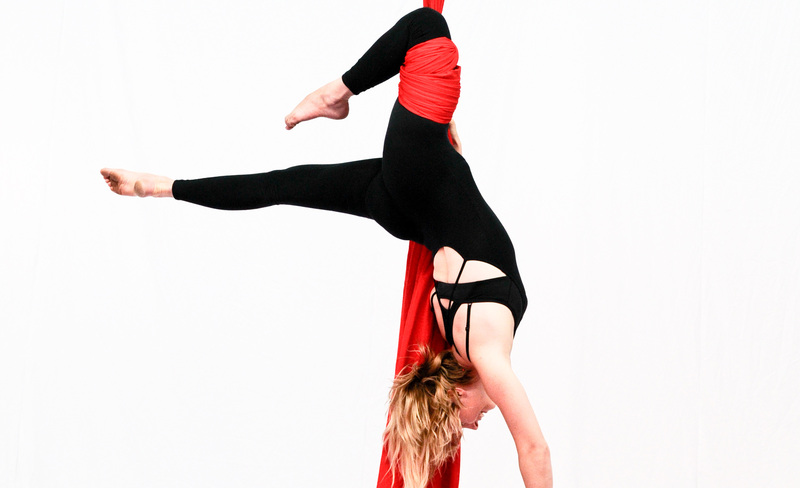 * A knee drop can include any kind of dynamic drop where the aerialist finishes the skill hanging by one knee with the tissu wrapped above the knee, or the thigh. As it turned out, the student’s foot had hit the post during a knee drop, and as a result they had sustained injuries to their medial collateral ligaments in the knee. * The medial ligament sits on the inside of the knee and protects the knee from side to side movements. 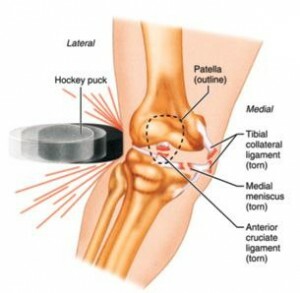 Injury to the medial ligament is common in contact sports, usually when the athlete receives a direct blow to the outside of the knee, which results in stretching and sometimes snapping of the ligament. But what happened to these aerialists wasn’t a blow to the outside of the knee – it was a knock to the foot! How could an aerialist hurt their knee when it hadn’t been struck directly? This got the physiotherapist part of my brain thinking. The way the coach had described the injury made sense: the foot hits the post during the side rotation of the drop, which reproduced the inward force that would snap or stretch the medial ligament in the same way if it were directly hit. When looking at the teaching style of a variety of aerial coaches, it is not uncommon for some to encourage the wraps around the leg to be nice and low, close to the knee. 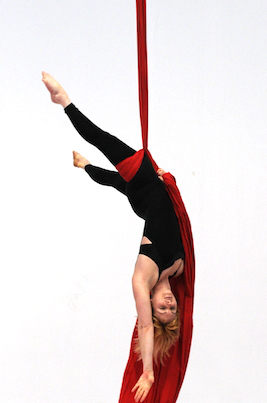 We also often encourage aerialists to bend their knee in the set-up of the drop to ensure a lock nice and early. These are great tips, and most coaches will continue to teach this way with no issues. However, there are two factors here that could potentially cause injury. Firstly: by wrapping the tissu low on the thigh, we end up with a longer tail in the hand, which generally sits looser. When dropping with a looser tail the wrap can slide microscopically, and if the wrap is already low on the thigh it slides onto the top of the knee joint. When this happens, we add stress to the medial ligament of the knee by constricting it and adding torque to the knee joint. Secondly: when encouraging a bent knee early in the set-up, it is very common for most students to bend their knee in such a way that the toe of the bent knee points towards the opposite knee. This is where I suspect that the students described to me ran into trouble. With a knee bend like that, there is hardly any space for the post to pass between the legs, and so the post smacks into the foot causing the inward force that can tear the medial ligament. What steps can we take to avoid this from happening? There are four simple teaching points that are very effective in preventing this type of injury. 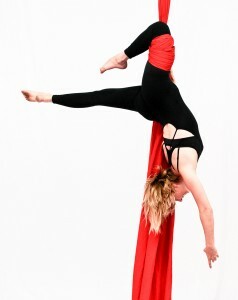 Doing this is generally less painful and it helps to create a shorter, tighter tail in the aerialist’s hand. Furthermore, if any sliding occurs, there is lots of room to move. If the tail is wrapped nice and high on the thigh, the student can keep both legs straight throughout the drop, landing in either a star position or pencil shape (legs together). This technique ensures plenty of room for the tail to pass between the legs and means the leg muscles are tight which causes less pain in the drop, as the tissu cannot constrict onto the thigh. If you need to teach the knee bent technique, then use this strategy. This creates plenty of space for the post to pass through the legs during the rotation as well as encouraging a great tight star body shape that is very useful in other moves. By doing so, this discourages forward folding at the tummy, which will loosen the tail of the tissu. But more broadly, an open chest and a squeezed bottom is very important for ALL drops so that the spine is well supported. Thanks so much for reading! I hope this post helps you in your coaching. If you have any comments or questions about improving your student’s technique, I would love to hear from you! Just leave a comment below. If you would like to find out more about Circus Training Australia, why not download a FREE teaching guide? If you are really serious about improving your teaching skills and making a difference for your students, check out our upcoming course dates. Fantastic ! Clear explanation and logical connection to a range of movements. Are there any drills to strengthen knees? I have dislocated both mine and they dislike having the tissu anywhere near the patella. Cheers!